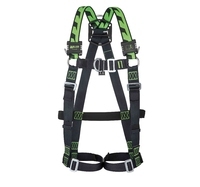 The Miller Titan Harness has standard rear anchorage 1 point safety harness, webbing chest strap. EN361. 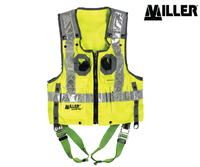 The Miller Hi-Vis Duraflex Harness has 2 point elasticated heavy duty vest harness with rear and front anchorage built into a comfortable and practical vest jacket, harness is teflon coated, hi-vis outer fully compliant, EN361 EN 471 Class 2/2. Miller market leading block arrest kit. Contains a 1-point Duraflex rear anchorage harness, a 2.5 metre shock absorbing retractable block and a 0.6 metre webbing sling. The block comes with two screw-gate karabiners. Comes in a protective plastic carry case. EN361 EN360 EN792(b). Mini Block certified for Factor 2 anchorage (below the feet), most other similar blocks are only certified for Factor 1 anchorage only (shoulder level or above). Lightweight and durable. Length: 1.8mtr when fully extended. Instantly arrests a free fall with a built in shock absorption system. 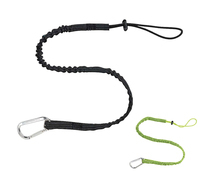 Twist-lock karabiners and a swivel system preventing life-line twisting. Extra large Scaffold Hook. EN360. New patent-pending Miller Twin Turbo™ G2 Connector and patented D-Ring Connector easily adapts two (2) lightweight Miller TurboLite™ for continuous 100% tie-off fall protection. Better alternative to double-leg lanyards – Reduces fall clearance requirements for use in more applications. PFLs swivel independently – Provides ultimate worker mobility and prevents webbing from twisting and binding in the unit. 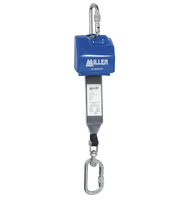 The Miller Rhino is the smallest and lightest 2.7m cable liveline on the market, no annual recertification required, corrosion-resistant components, quick activating braking system in high strength stainless steel, integrated fall indicator and internal shock absorber, Aluminium housing and hub. EN360. 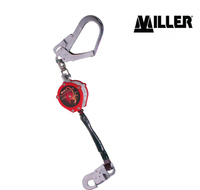 The Miller Scorpion an an affordable compact and durable product, karabiner on one end with a swivel snap hook on the other, 2.5m teflon coated webbing lifeline, built in shock absorber. EN360. 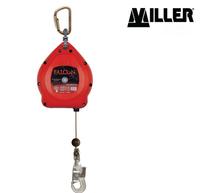 The Miller Falcon is a lightweight fall arrest block, highly visible fall indicator, high quality steel internal mechanism, lightweight webbing lifeline, double action snap hook. EN360. 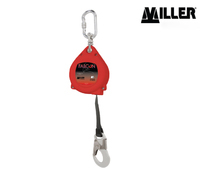 The Miller Falcon is a lightweight fall arrest block which can be used in a horizontal anchorage position, highly visible fall indicator, high quality steel internal mechanism, galvanised steel cable, double action snap hook. EN360. 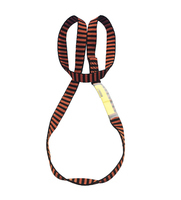 The MILLER Kernmantel Rope Restraint Lanyard is designed to keep a person restained in a set position to prevent a fall risk from occuring, karabiner on each end. 2 metre length. Kernmantel is 2 times more resistant to abrasion than a standard rope. EN354. 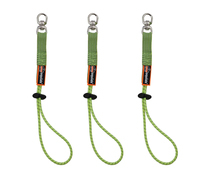 The MILLER Kernmantel Rope Restraint Lanyard is designed to keep a person restained in a set position to prevent a fall risk from occuring, karabiner on each end. 1.5 metre length. Kernmantel is 2 times more resistant to abrasion than a standard rope. EN354. 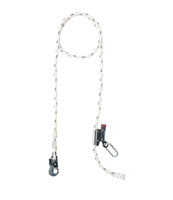 The MILLER Kernmantel Rope Restraint Lanyard is designed to keep a person restained in a set position to prevent a fall risk from occuring, karabiner on each end. 1 metre length. Kernmantel is 2 times more resistant to abrasion than a standard rope. EN354. 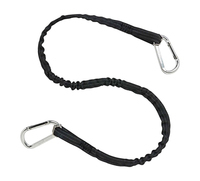 The Miller product is a 12mm polyamide Rope Restraint Lanyard designed to keep a person restained in a set position to prevent a fall risk from occuring, karabiner on each end. EN354. The 1008288 MILLER Titan Work Positioning Lanyard is ideal for construction and general maintenance. Length 2M. Comes with loop and 2 twist lock karabiners. EN358. 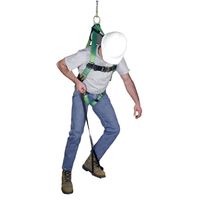 Ideal for those who have to work at height in a safe and supported hands-free position. 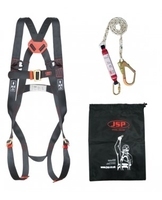 The lanyard is fitted around a supporting structure and then connected to the side D-rings on the operator's belt or harness. Polyamide rope 16mm with aluminium jaw type adjuster. EN358. The Miller Titan Lanyard is a 2 Metre rope shock absorbing lanyard complete with a scaffold hook and a karabiner, external shock absorber. EN354 EN355. The Miller Titan Double Lanyard is a 2 Metre double webbing shock absorbing lanyard complete with a karabiner and two scaffold hooks, gives 100% tie off protection. EN354 EN355. 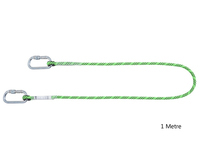 The Miller Manyard is a stretchable shock-absorbing lanyard, teflon coated to improve durability, reduces trip, snagging, and dragging hazards, with scaffold hook and galvanised connector. EN354 EN355. 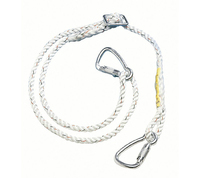 The Miller webbing anchorage sling is important to ensure a user does not anchor back onto their own lanyard. (i.e. choke the lanyard). EN795 (b). 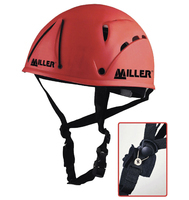 Miller important webbing anchorage to ensure a user does not anchor back onto their own lanyard. (i.e. choke the lanyard). EN795 (b). 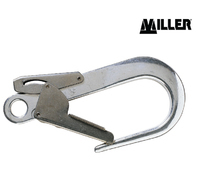 Miller reinforced anchorage option, steel sling with a loop on each end, protective plastic casing around steel wire, suitable for use around heavy girders, for use with retractable blocks. EN795 (b). Miller anchorage connector used for securing an intermediate attachment to an anchoroage point, quick release action, EN362. Miller galvanised connector with keylock, connector is found on most lanyards. EN362. Needed to fix winch onto the tripod. Different brackets for different length winches. 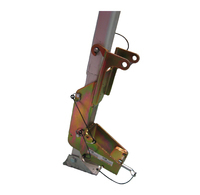 Used in conjunction with the Miller Tripod and dedicated brackets to form the core of a stable and secure confined entry/rescue system. 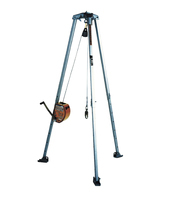 4.8mm galvanised steel cable, quick-activating retrieval winch mechanism, pressed steel housing and compact design, corrosion resistant components, convenient heavy duty carrying handle, fall indicator. Available in 2 lengths 15Mtr or 30Mtr. Protects impacts from above and side. Polypropylene climbers helmet with fully adjustable cotton lining and good air circulationreducing the build up of moisture. Comfortable skull webbing and chin strap. Fitted with attachment point for head torch. EN397. The Miller Relief Step is designed to alleviate the symptoms of suspension trauma following a fall, the relief step is fitted to the harness and can be deployed for increased short term safety. For use by one person only. Fast and easy to install. Maximum working length 12 metres. Durable braided rope with two galvanised connectors. Fixes to either permanent anchorage points or temporary webbing anchorage slings. Supplied with two 1.5m webbing anchorage slings. ERGODYNE SQUIDS 3110 is a Tool Lanyard Tool Lanyard with Dual Karabiners. 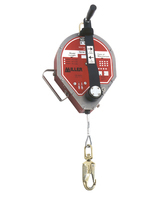 Tethers tools to help worker prevent injury, damage and lost productivity from dropped tools. Energy absorbing cord with tubular nylon webbing, Single action aluminum karabiners, Reflective accent for higher visibility, Lock stitching at both ends for extra security, Captive eye Karabiner, Maximum safe working capacity: 10lbs (4.5kg), (89cm-107cm). 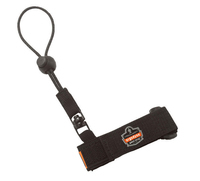 ERGODYNE SQUIDS 3115 is an Adjustable Wrist Lanyard. 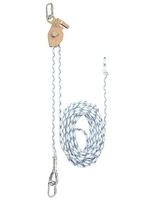 Tethers tools limiting the distance of a dropped tool and reduces snag hazards. Polyester webbing cuff secures to wrist, Energy absorbing ribbed pull cord, Adjustable loop with barrel lock for tool attachment, Short length improves the drop clearance needed, Wrist Measurement: S/M - 5in (13cm), L/XL - 7in (18cm), Tether length 7.5in / 19cm, Maximum safe working capacity: 2lbs (0.9kg). ERGODYNE SQUIDS 3130M Coiled Cable Tool Lanyard keeps the length of the lanyard close to the anchoring point, reducing snag hazards of traditional lanyards while preventing dropped objects. The patent pending swivelling design prevents tangles and headaches the coiled design can cause and reduces recoil force preventing aggressive snap back. Constructed with PU covered aircraft cable, Stainless steel karabiners, Coil design prevents snag and tangle hazards, Captive eye karabiner. Coiled length 6.5in (16.5cm); Extended length 50.0in (127cm), Maximum safe working capacity: 5lbs (2.26kg). ERGODYNE SQUIDS 3713 Elastic Loop Tool Tails™ provide retrofit attachment points to a variety of tools and equipment up to 10lbs (4.6kg) using Squids® Tool Traps™. 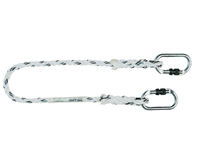 These Tool Tails can also be used as an anchor point on belt, harness or separate structure. Stretch cord surrounded by tubular nylon webbing, Plated swivelling connection, Adjustable barrel lock for tool attachment, Use as an anchor for belt, harness, or structure. Standard Length 11in (28cm). Maximum safe working capacity: 10lbs (4.6kg). 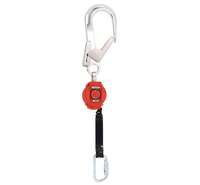 ERGODYNE SQUIDS 3101 Tool lanyard with single stainless steel manual locking screw gate karabiner for a secure connection in more corrosive environments. Energy absorbing cord with tubular nylon webbing, Manual locking stainless steel karabiners, Captive eye karabiner, Reflective accent for higher visibility, Lock stitching at both ends for extra security, Maximum safe working capacity: 15lbs (6.8kg). 35in - 42in (89cm-107cm). 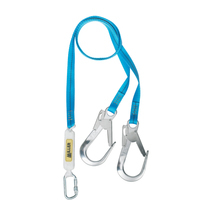 MILLER 1.5M RESTRAINT LANYARD C/W 2 Karabiners. 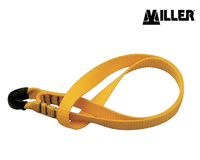 The Miller product is a 12mm polyamide Rope Restraint Lanyard designed to keep a person restained in a set position to prevent a fall risk from occuring, karabiner on each end. EN354. 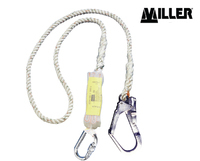 Miller kernmantel single restraint lanyard 1,5 meters with a steel twist lock karabiner and a GO55 steel scaffold hook. 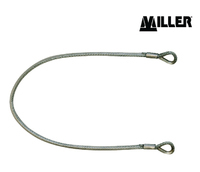 Miller kernmantel single restraint lanyard 2 meters with a steel twist lock karabiner and a GO55 steel scaffold hook. 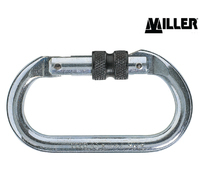 Miller H-Design Duraflex 1 point with dorsal point, mating buckles on chest and legs straps and Miller 2 m elasticated Manyard complete with galvanized connector and scaffold hook opening 63 mm. Shoulder Straps : Duraflex Stretch 44,5 mm webbing. PES with PTFE treatment (water repellent / anti stain) Colour : green with a black drawing. Breaking strength : > 2200 daN. Other Straps : Standard black webbing 44 mm. PES with PTFE treatment (water repellent / anti stain) Breaking strength : > 2700 daN. Back Anchorage D-ring :Material : steel. Finish : Zinc plated Silver. Breaking strength : > 2300 daN. Steel mating buckles Finish : Zinc plated Silver. Breaking strength : > 900 daN Elasticated Manyard Woven shock absorbing core. Woven shock absorbing core Reduction of impact force: < 500 daN. 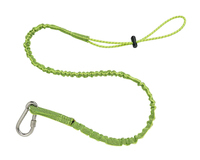 Heavy tubular outer webbing: Polyamide webbing 45mm – green. Breaking strength: > 2500 daN. CS20 galvanized steel karabiner 17 mm. Standard: EN 362. Breaking strength: > 2500 daN. Scaf hook: Scaffold hook Opening: 65 mm. Breaking strength daN > 2200. Material : auluminium0. Breaking strength :< 15KN. Weight of the kit : 2.98 kg. This product replaces SS1006883. 2-Point Spartan™ Harness. 1.8m Fall Arrest Shock Absorbing Lanyard. JSP® woven draw-string bag. EN 361, EN355, EN362. MILLER H-Design Duraflex 1 point harness W/O FI. Size 2 -Med. 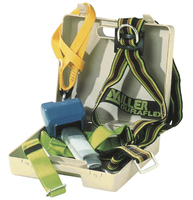 Miller H-Design 1 point harness with Stretched shoulder straps and mating buckles. 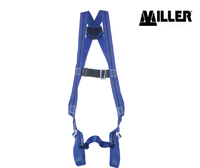 The Miller H-Design harnesses are the new generation of harnesses dedicated to construction and general industry sectors providing more comfort, freedom of movements and safety to workers. Shoulder Straps : Duraflex Stretch 44,5 mm webbing . PES with PTFE treatment (water repellent / anti stain). Colour : green with a black drawing. Breaking strength : > 2200 daN. Other Straps : Standard black webbing 44 mm. PES with PTFE treatment (water repellent / anti stain). Breaking strength : > 2700 daN. Back Anchorage D-ring : Material : steel. Finish : Zinc plated Silver. Breaking strength : > 2300 daN. Mating buckles : Material : steel. Finish : Zinc plated Silver. Breaking strength : > 900 daN. Weight 1034982 H-Design Duraflex 1pt mating Size 2 1kg. The MILLER H-DESIGN Duraflex Harness has patented elasticated rear and front anchorage 2 point safety harness that stretches for extra comfort, improved safety and increased productivity, front anchorage soft webbing lops for chest anchorage, webbing chest strap. EN361. Miller H-Design Duraflex 2 points harness with 2 webbing loops at the front and automatic buckles on chest and legs straps. Size 2. Shoulder Straps : Duraflex Stretch 44,5 mm webbing PES with PTFE treatment (water repellent / anti stain) Colour : green with a black drawing Breaking strength : > 2200 daN. Other Straps : Standard black webbing 44 mm PES with PTFE treatment (water repellent / anti stain) Breaking strength :>2700 daN. Back Anchorage D-ring : Material : steel Finish : Zinc plated Silver Breaking strength : > 2300 daN. Sternal anchorage point : long webbing loops. Aluminium automatic buckles : Breaking strength : > 900 daN. Steel mating buckles : Finish : Zinc plated Silver Breaking strength :> 900 daN. Weight : 1,10 Kgs. Breaking strength:> 15 KN Temperature: -30°C to +50°C EN 361 Full Body Harnesses. Certified for a maximum load of 140 kgs. 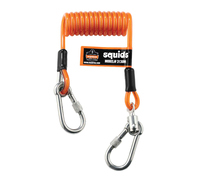 ERGODYNE SQUIDS 3100 is a Tool Lanyard with Single Karabiner. 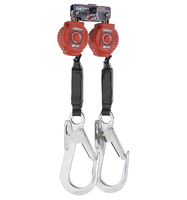 Tethers tools to help worker prevent injury, damage and lost productivity from dropped tools. Energy absorbing cord with tubular nylon webbing, Single action aluminium karabiner, Captive eye karabiner, Reflective accent for higher visibility, Lock stitching at both ends for extra security, Maximum safe working capacity: 10lbs (4.6kg). (89cm-107cm).